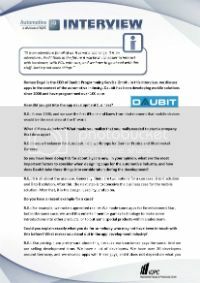 Roman Engel is the CEO of Daubit Programming Service GmbH. In this interview, we discuss apps in the context of the automotive industry. Daubit has been developing mobile solutions since 2008 and have programmed over 100 apps. stuff. Just try out some things." How did you get into the app development business? It was 2008, and we saw the first iPhone and knew from that moment that mobile devices would be the next step of the IT world. What did you do before? What made you realize that you really needed to start a company that does apps? I was a freelancer for Autodesk. I did workshops for Daimler Protics and Rheinmetall Defence. So you have been doing this for about 5 years now. In your opinion, what are the most important factors to consider when designing apps for the automotive industry, and how does Daubit take these things into consideration during the development? It is all about the use case. Generally, there are two options for a use case: B to C solution and B to B solution. After this, the next step is to conceive the business case for the mobile solution. After that, it is the design, usability, and so on. Do you have a recent example for a case? For example, we make augmented reality. We made some apps for Entertainment Star, but in the same case, we used this entertainment or games technology to make some introductions into other products, or to put some special products within a sales team. Could you explain exactly what you do for somebody who may not have been in touch with this before? What makes you stand out in the app development industry? Our pricing. I am pretty sure about this, because each customer pays the same. And we are selling development time. We have a lot of developers. We have over 20 developers around Germany, and we develop apps with these guys, and it does not depend on what you want, because we have specialists in some areas, for example Open GL ES or augmented reality etc., and these guys develop for the same price. It does not depend on the customer. For example, we are developing an app for Fresenius and they pay us the same rate as a start up from Frankfurt would. That is one thing that sets you apart, but also perhaps the versatility of your employees? For sure. We have some guys in Dusseldorf, freelance developers, who have been developing software for over twenty years - pretty graphic-based software and they have been developing apps for us for two years. It is like a shop. For example, you come into REWE and you need an apple and a banana except we are offering technology. For example, you need someone for Objective C. You come inside and the price for Objective C is the same all the time. Regarding automotive apps again, and considering safety within driver connectivity, what is your opinion on the future of hands-free technology? Obviously there is some debate about cognitive distraction when you are thinking about safety. In a recent survey of ours, 68% of respondents noted that the hands-free technology is a focus of the current industry development. What is your view on this? Do you know Star Trek? It is like this. Kirk can talk with the whole spaceship. He can make commands. It is all about commands. Or, for example, Knight Rider. I think this is a better case. It is not only the safety; it is all about how intelligent your car is. For example, you have an accident, and the car recognizes that it is an accident and what happens with the guys inside the car, and sends all the information to the emergency services automatically with all the intelligence behind the car and its IT. You need more commands, more commands like: ‘Car, do this,’ or ‘car do that.’ This will mean that there are less buttons being pushed and more control over voice interaction. Okay, so you would say that something that will develop more extensively in the future and that we will see more of? Sure, there are a lot of software development kits for recognizing speech, and it doesn’t matter which kind of speech or language. For example, there are some guys from Munich who’ve developed an SDK for technical speech in different languages, for medical speech, and so on. It is pretty cool, and you can combine these techniques with cars. Speaking of combining them with cars - the speed of the mobile industry is rapid. It is developing at an incredible speed, and if you combine this with the auto industry – how can those match? How can auto companies best keep up with that speed in your view? By investing in new ideas. I think the best example for this is Mr. Porsche. This guy developed an electric car 100 years ago. This technology was used to drive on the moon. We have to be orientated in this innovative and creative direction, and go ahead with it. Just try it out. And do you also do this at your company? Yes, of course. We have a few guys who are only developing new stuff; just trying to develop new technology for mobile devices. For example, two years ago we developed our own augmented reality system, which we put inside load CID files or Autodesk Alias or something like that, and converted it to augmented reality. And it was awarded at the C-BIT and CODE N12 award to the top fifty leading companies worldwide. That sounds like a great success. How did it exactly work? What was the main purpose of this? We were just developing this augmented reality solution because we believed in the mobility and the use case and the business case of mobile apps. And I think it is some pioneering work. We are just trying it out, what is possible with a smart phone, what is possible with a car, what is possible with this technology, and combining products, then going to get some feedback from customers…and developing tools in this way. And do you have some feedback from customers or production? Sure. In a lot of cases we developed some pretty simple catalogue apps. This catalogue app is cable, and we sell it to a few companies. We get great feedback from the sales team. And this feedback we put into the next version. And the same goes for augmented reality. Do you also have some user feedback from the customers that actually use it? In general our business is B2B. Do you do any B2C development? Yes, we have some business to client products, but this is not our main way to make business. If someone has a great idea and some great cases, and can earn money with this, and needs a technical guy or girl or programmer or coder or designers, then in this case, we can offer some services, some techniques and skills to make business together. And it is pretty different. For example we have customers from healthcare, for example Fresenius, and on the other hand we have some guys who sell tractors. We are not specialized in some special theme. We are specialized as a technology company. Finally I have a question about the apps you are developing. How do you foresee the role of cloud-based apps? Do you think they are a necessary development? Cloud is great. What does cloud mean? It means thousands of computers providing special services on the internet. And I think each app connected to the cloud services is great. We have a problem that we do not have the same quality of the internet everywhere. The connection is not always fine. Do you work with cloud-based apps? Or will you in the future? For example, we have developed an app based on cloud technology for Wikipedia. We used two cloud technologies. The first one to get data, specifically dates, from Wikipedia, put it to the user and to get speech from another cloud system. And this app is great. It is working pretty well inside a city because it is based on the internet connection. But if you go 20km outside of Wiesbaden it doesn’t work anymore. So do you think that cloud-based apps will only make sense if the connectivity and internet connection in general will increase? Sure, if you look at Africa. The guys there have a better internet connection than we do in Germany. And they depend on it. So you see Africa as a potentially big market or are you already doing business there with the apps? We are selling software on mobile solutions everywhere. For example we have some customers in Japan, in China, in the States, in Brazil, everywhere. And we are starting to do business with Africa for some B2B solutions. As a final question … what is it that excites you most about the future of this field of app development, and what do you see as the most important challenge? It is an adventure for all of us. It is not a challenge, it is an adventure. For example, Google glass: In Germany we need a lot of time to understand what a new technology is and how we can use it. I have a lot of customers who are asking me all the time ‘do you make Facebook apps’? And by the way, Facebook is more than 10 years old. And now in Germany especially, the companies are slowly starting to think about mobile. But what does mobile mean? What does it mean to interact? This is the easy interaction between human and computer. And I think in the future it will be much easier to interact with hardware, with PCs, with cars, and we have to go ahead with this stuff. Just try out some things.